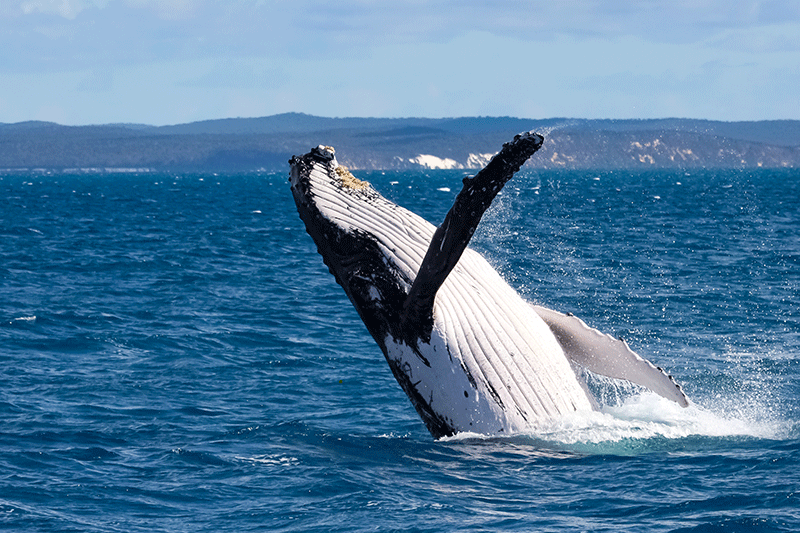 In a collaborative effort between several organisations, including conservation authorities, conservation NGOs and South African universities, a survey of the population status of migrating humpback whales commenced at the end of June in the iSimangaliso Wetland Park, KwaZulu-Natal. The survey will form part of a long term, shore-based migration survey of humpback whales which was designed and initiated in 1988 by Prof Ken Findlay (now Cape Peninsula University of Technology – CPUT) and Dr Peter Best (University of Pretoria’s – UP – Mammal Research Institute) to track the population increase of humpback whales as they recovered from commercial whaling pressure. Commercial whaling practiced off the northern KwaZulu-Natal coastline between 1908 and 1979, decimated populations of whales in these waters. The protection of humpback whales in 1963 marks one of the great South African marine conservation success stories with numbers steadily increasing over this time. “The recovery of Southern Hemisphere humpback whales from severe whaling pressures last century when some 210 000 animals were whaled, must rate as one of the world’s great conservation recoveries. Populations that migrate on the KZN coast each year were whaled in the Antarctic, on their migration and in their Mozambican breeding grounds. Their current recovery at some ten percent per annum is really heartening to see,” commented Prof Ken Findlay (CPUT). The dunes at Cape Vidal in the iSimangaliso Wetland Park, a world heritage site, provide an ideal vantage point to undertake these shore-based migration surveys. Along this stretch of coastline, migrating humpback whales are funnelled close inshore by the coastal orientation as they head northwards towards their breeding grounds in Mozambique and again back south to the feeding grounds later in the season. Wildlife ACT, a conservation NGO which specialises in professional endangered and priority species monitoring, will station monitoring teams on two towers located on top of the Cape Vidal dunes to undertake the full time and consistent monitoring required over a two month period. The monitoring will focus on gaining an estimate of overall numbers and group sizes, understanding daily densities of migrating whales as well as gathering data on migration speed and bearing and distance off shore. Results from this project will allow scientists and conservationists to expand on current knowledge of the east coast humpback whale migration and therefore estimate any changes in the population. “Over the past decade, it has been presumed the humpback whale population is increasing as the number of reported mortalities have increased. However, threats to these whale populations are accelerating,” said Jennifer Olbers, Ezemvelo KZN Wildlife Marine Ecologist. “Whales communicate using low-frequency acoustic signals which allow interaction over large distances. Noise in the ocean including from large ships or offshore mining activities can overlap with these acoustic signals used by humpback whales, and have been reported to induce habitat displacement, behavioural changes and alterations in their acoustic signals. The iSimangaliso coastline offers an important area in which ocean noise from anthropogenic sources is reduced because shipping lanes are further from the coastline and offshore mining is prohibited, making it an ideal location for such a monitoring survey” concluded Olbers. Conservation Canine Annie nabs three poachers in one day!